There is no shipping outside of the United States or Canada at this time. 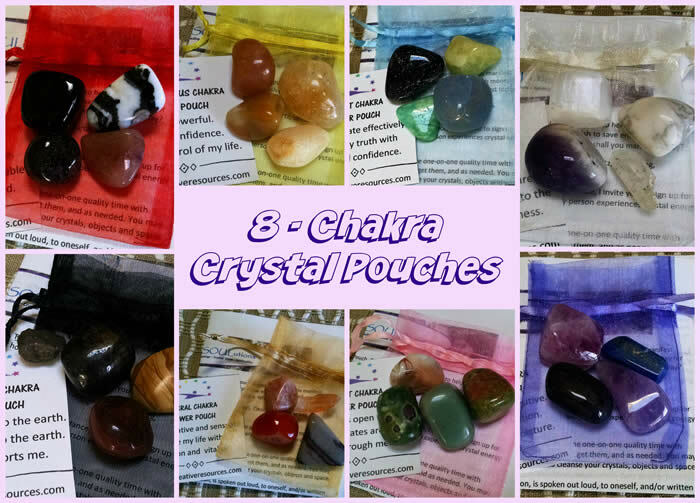 A variety of power pouches designed to assist with chakra balancing. 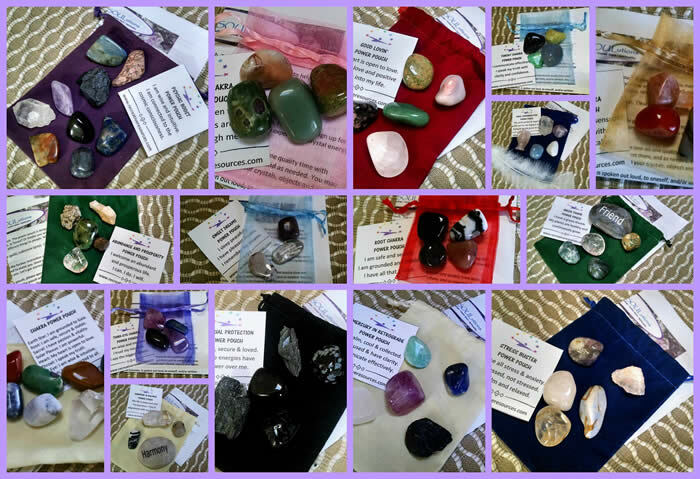 Mercury in Retro, Stress Relief, Angels, Love, Abundance, Psychic, Dreams, etc. 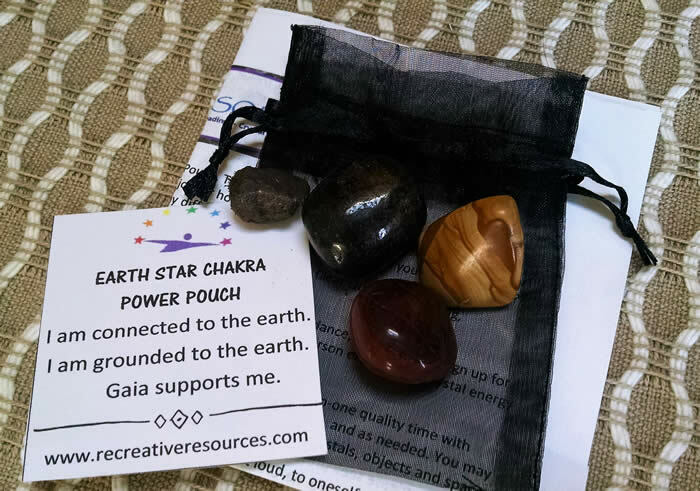 This pouch is designed to help balance the Earth Star Chakra which is said to be located anywhere from 6 to 36 inches below the feet, aligned with the spine. Includes one of each: Picture Jasper, Lodestone rough, Andalusite, Hematite Jasper, organza bag, affirmation card, and printed directions. This pouch is designed to help balance the Root Chakra which is said to be located at the base of the spine in the area of the tailbone. 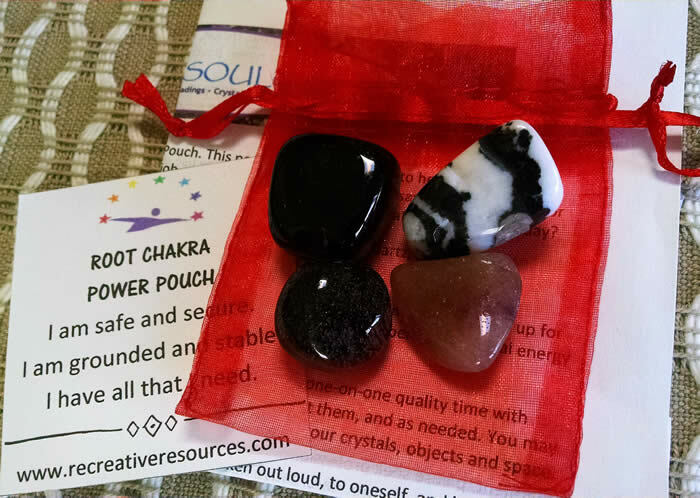 Includes one of each: Red Tiger Eye, Black Agate (dyed), Red Aventurine, Zebra Jasper, organza bag, affirmation card, and printed directions. Stones range from 3/4 to 1.25 inches and are tumbled, unless stated otherwise. Shipping cost is NOT included in this fee. An invoice for shipping cost will be sent to your email for separate payment. 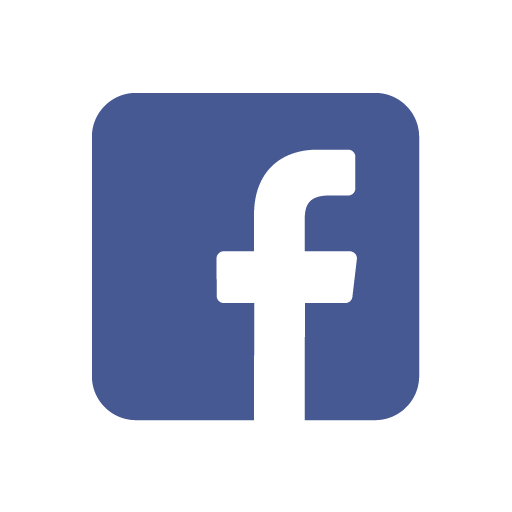 Learn about shipping here. 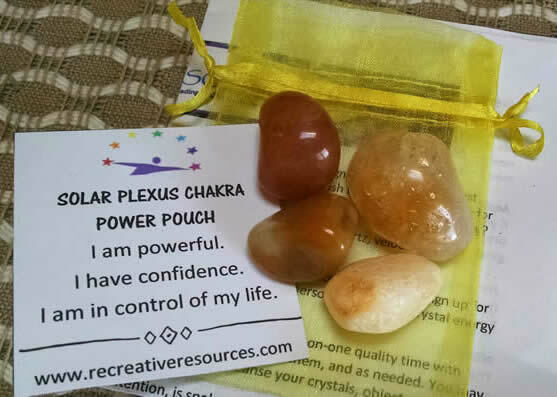 This pouch is designed to help balance the Sacral Chakra which is said to be located in the lower abdomen below the navel and in the genital region. Includes one of each: Carnelian (may be treated), Sunstone, Shiva Lingam, Tangerine Quartz point, organza bag, affirmation card, and printed directions. This pouch is designed to help balance the Solar Plexus which is said to be located just above the belly button. Includes one of each: Citrine (baked Amethyst), Yellow Calcite, Yellow Jasper, Golden Quartz, organza bag, affirmation card, and printed directions. 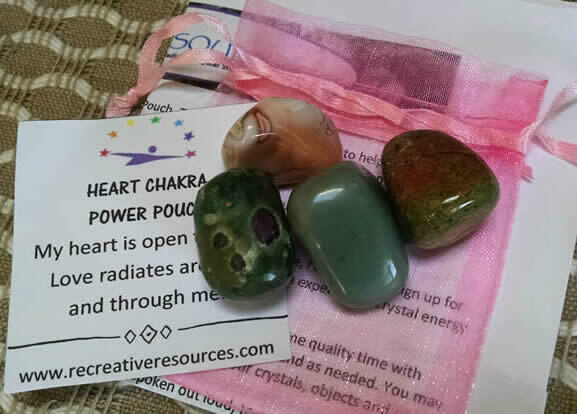 This pouch is designed to help balance the Heart Chakra which is said to be located in the center of the chest. Includes one of each: Green Aventurine, Unakite, Pink Botswana Agate, Ruby Fuschite, organza bag, affirmation card, and printed directions. This pouch is designed to help balance the Throat Chakra which is said to be located in the throat area and base of neck. 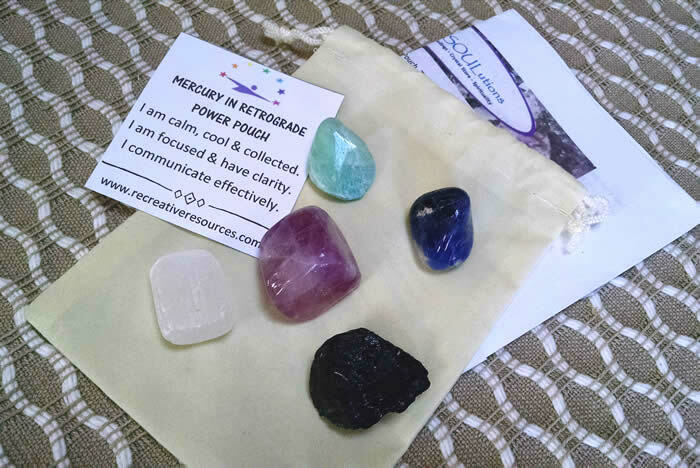 Includes one of each: Blue Aventurine, Amazonite, Aquamarine, Angelite, organza bag, affirmation card, and printed directions. This pouch is designed to help balance the Third Eye Chakra which is said to be located in the middle of the forehead. Includes one of each: Amethyst, Purple Agate (dyed), Lapis Lazuli, Fluorite, organza bag, affirmation card, and printed directions. 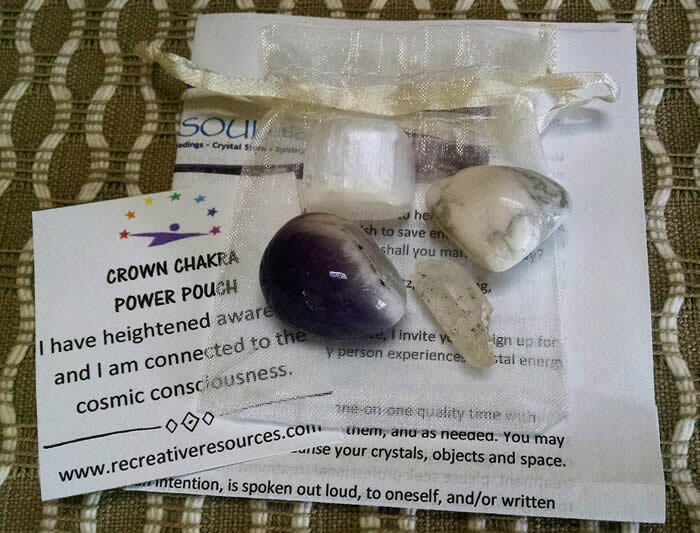 This pouch is designed to help balance the Crown Chakra which is said to be located on the top of the head. 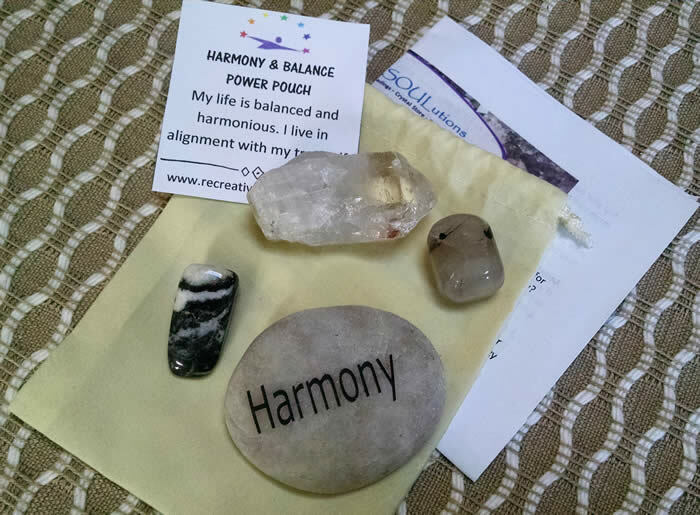 Includes one of each: Tibetan Quartz point,White Howlite, Chevron Amethyst, Satin Spar, organza bag, affirmation card, and printed directions. 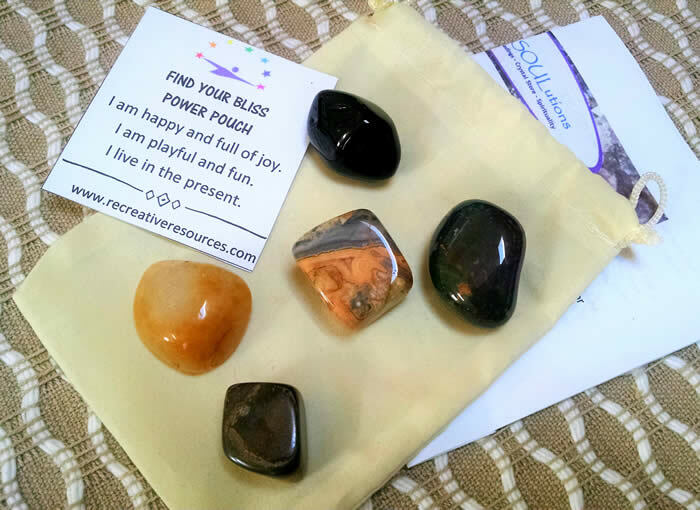 This power pouch is designed to help you manifest abundance or prosperity. Perhaps you are looking for a new job,or house? Or maybe you wish to save enough money for that trip to Hawaii? Abundance and prosperity can mean many different things to people so what shall you manifest today? Includes one of each: Citrine point, Jade, Pyrite, Lodestone rough, Clear Quartz, velour bag, affirmation card, and printed directions. Feeling a little spacy or disconnected? 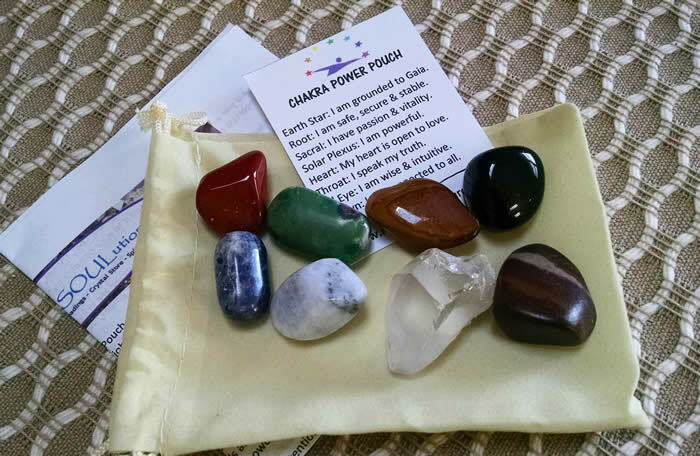 This power pouch will help to ground your energy so you can focus and connect to Mother Earth. Get your feet on the ground. You have a mission to accomplish! 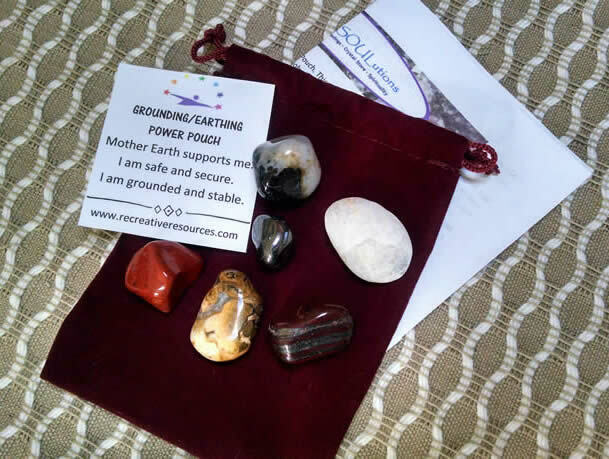 Includes one of each: Spotted Agate, Red Jasper, Hematite, Tiger Iron, Black Sardonyx, velour bag, affirmation card, and printed directions. Mercury in Retrograde happens a few times a year. It can be a time of confusion, forgetfulness, miscommunication, reflection, letting go and taking care of the soul. 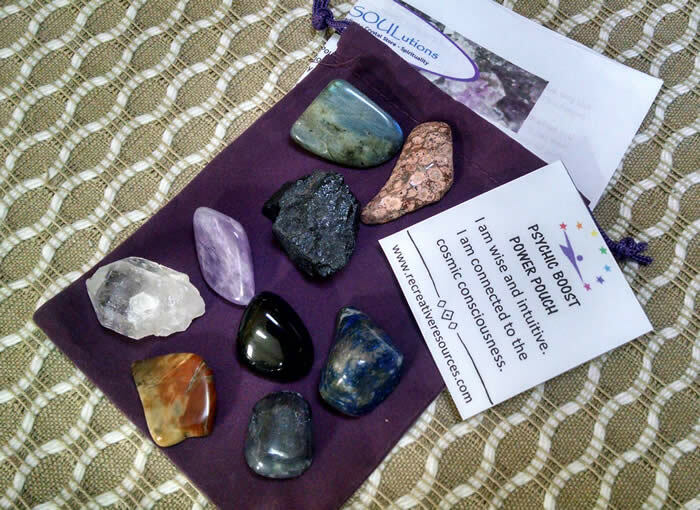 Includes Amazonite, Sodalite, Satin Spar, Fluorite, Black Tourmaline rough, velour bag, affirmation card, and printed directions. 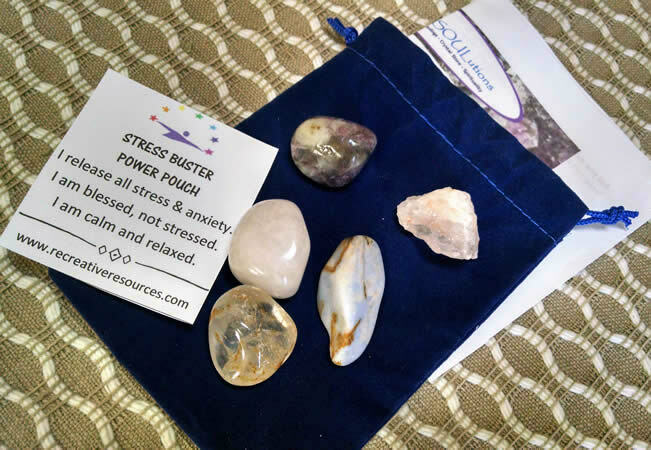 This powerful pouch is designed to help keep the negative or unwanted energies away, so that you can go about your day feeling great. Say bye-bye negativity! Includes one of each: Black Onyx, Snowflake Obsidian, Black Tourmaline rough, Black Agate (dyed), Black Kyanite blade, velour bag, affirmation card, and printed directions. Feeling a little blue or unmotivated? 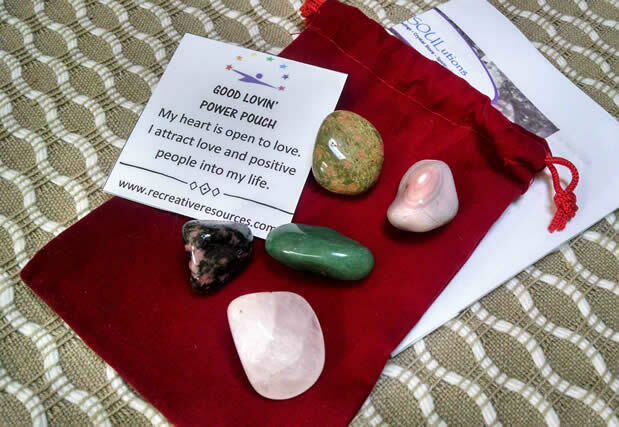 This crystal power pouch is designed to put a little pep in your energetic step and play in you day. Includes one of each: Yellow Jasper, Apache Tear, Fancy Jasper, Crazy Lace Agate, Tiger Eye, velour bag, affirmation card, and printed directions. 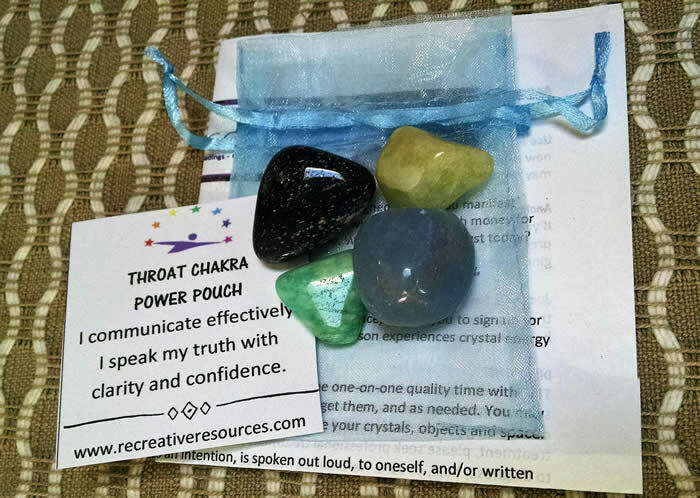 This power pouch is designed to help you communicate with angels and spirit guides. 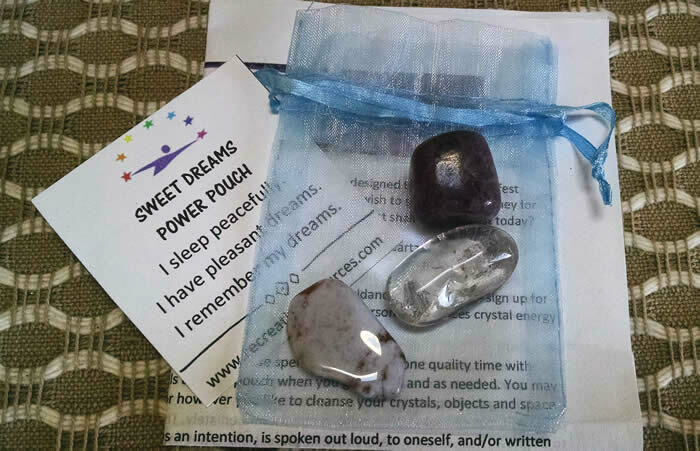 Sometimes we really just need to be still and quiet so that we can perceive their contact, but this power pouch is an excellent tool to amp up your intentions and meditation experiences. 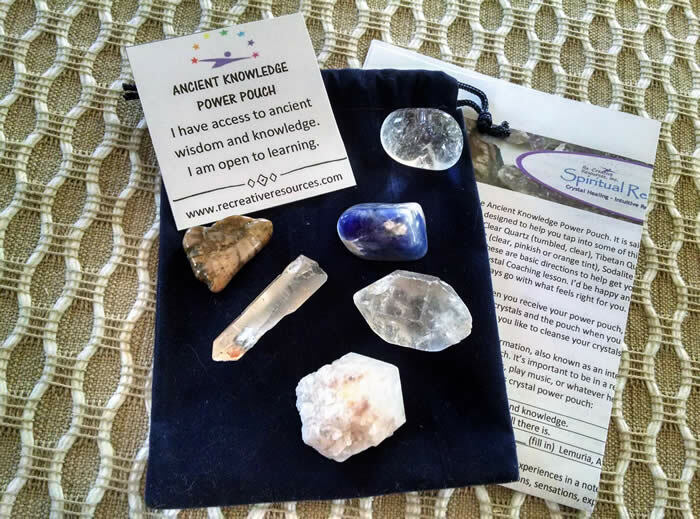 Includes: Gemstone Angel (stone type may vary), Clear Quartz point, Chevron Amethyst, Angelite, Blue Calcite, feather, velour bag, affirmation card, and printed directions. This power pouch is designed to help you have a more restful sleep and improved dream recall. Night night! Includes one of each: Smokey Quartz (may have been irradiated), Blue Chalcedony, Lepidolite, organza bag, affirmation card, and printed directions.